"Do you want to see a ghost?" This tantalizing question mysteriously pops up on the computer screens of six hapless victims in Jim Sonzero's 2006 remake of the Japanese horror film Kairo. Without hesitation, each of the victims click on the link. Viewers who sit down to watch this film would likely respond the same way. After all, isn’t that why we watch horror films? For a glimpse of the unknown? Pulse reminds me of the now-quaint notion, from the early days of filmmaking, that technology had made immortality possible. Bela Lugosi, though buried in his Dracula cape many decades ago, still walks and talks onscreen in 2008, so in a sense he is as immortal as the fictional vampire he often played. Anyone who wants to take this idea one step further might suggest that he is eternally trapped, a victim of that technological vampire called film – doomed to repeat the same motions, actions and lines over and over again for all time. Contemporary moviegoers are so accustomed to watching movies that we seldom think of them in such metaphysical terms. Pulse asks us to suspend our disbelief for a while. What if, it asks, instead of watching the movies, the movies were watching us? The story begins when college student Maddie (played by the appealing Kristen Bell) sees her boyfriend Josh commit suicide. She blames herself at first, until she and her friends begin seeing the otherworldly faces of dead strangers on their computer screens. Before long, they learn that Josh has unwittingly released "ghosts from the machine" – essentially breaking down a metaphysical firewall that separates the energy of the living from the energy of the dead. Now the spirits of the dead are roaming free in our world, traveling through electrical circuits… and they’re hungry. It’s an intriguing premise, but of course it’s not as novel as it was a few short years ago. The idea that the technology we use in our everyday lives can kill us has become the dominant theme of Japanese horror films and their inevitable American remakes. Kairo was among the most atmospheric of the lot, but also one of the most frustrating, due to very slow pacing and a muddled narrative. 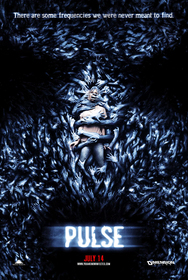 The makers of Pulse have wisely clarified the story – tracing the soul-sucking virus to its point of origin and explaining why red tape is somehow able to stop the ghosts (at first, I thought it was just silly joke about bureaucratic "red tape," but one character suggests that it has more to do with the electromagnetic spectrum). The American filmmakers have also streamlined the story, trimming it down to a lean hour and a half without losing the key moments that made the original so effective. Admittedly, the rapid-paced editing becomes disorienting at times, but at least it serves the story – prompting us to mistrust our own eyes so that we never feel the characters are truly safe in any situation. 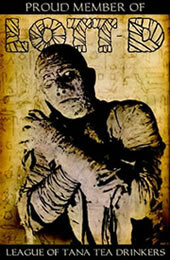 The story has also been adapted to fit within the tradition of modern American horror films. Like M. Night Shyamalan’s Signs (2002), it reads as an homage to the classics. Cult icon Brad Dourif pops up briefly in a diner to spout a wild "end of the world" theory – not unlike the local lunatic prophet in Hitchcock’s The Birds (1963), or in dozens of slasher movies. Panic-driven news broadcasts about the "suicide epidemic," as well as haunting images of an army of hungry ghosts, are constant reminders of George Romero’s seminal Night of the Living Dead (1968). And of course there are more than a few thematic connections to the film universe of Wes Craven, who co-wrote Pulse with newcomer Ray Wright. Since Deadly Blessing (1981), many of Craven’s films have pit strong female heroines against supernatural forces. Most notable are his Elm Street movies. In A Nightmare on Elm Street (1984), Nancy was able to defeat Freddy Krueger by facing, and thus dispelling, her fears. Ditto for Kristen, the female heroine of A Nightmare on Elm Street Part 3: Dream Warriors (1987). In that film, the victims were a group of apparently suicidal teenagers. Craven’s script wisely illustrated that the teenagers did not want to die; they simply wanted to escape being alone and afraid. The same is true of the characters in Pulse – the horror they face is existence in a world without hope. And, as in Romero’s Dead movies, it is a world where death offers no escape from the horrors of life. Talk about bleak! Even Maddie’s professor (Wes Craven’s onscreen counterpart?) doesn’t realize how dire the situation is. He urges her to face her fears, without considering the possibility that her worst fears have already been realized. The only chance her character has for a happy ending is to flee to the technological "dead zone" of rural America. Like John Carpenter’s anti-hero Snake Plisskin (in Escape from L.A.), this film demands a societal reboot. Viewers and critics have been particularly harsh with Pulse, and I think perhaps it’s because the film is ultimately so bleak. From frame one, it places us in a drab, depressing world (at one point while watching the film, my girlfriend said, "No one will want to go to Columbus, Ohio, after they see") – much like the J-horror remake Dark Water (2005). Both of these films create a thoroughly pervasive atmosphere of dread, and establish death as a constant, crushing, unavoidable force in our lives. Whether or not the viewer likes these films, I think, is largely a question of whether that viewer watches horror films partly to address such terrifying possibilities. I like horror films that leave me feeling a bit drained – not just a rollercoaster ride that makes me jump in my seat and gets the blood flowing, but a thought-provoking story that makes my blood run cold for a while afterwards. Despite a falsely reassuring voiceover at the end of the film, Pulse left me in an emotional dead zone – adrift in the unknown. For a while, my mind lingered in the world of that film where the everyday had been turned inside out, where "reality" could not be taken for granted. It seems to me that, in the past few years, most horror films have been grounded in the physical world, and the fears of their characters have generally been related more to physical damage rather than psychological or spiritual damage. I am much more drawn to horror films that explore the otherworldly – asking me to believe in the magic of the intangible, the unknown and the seemingly impossible. Pulse fits that bill and, for those who appreciate the gothic style of horror that reaffirms the supernatural, it is a minor masterpiece.